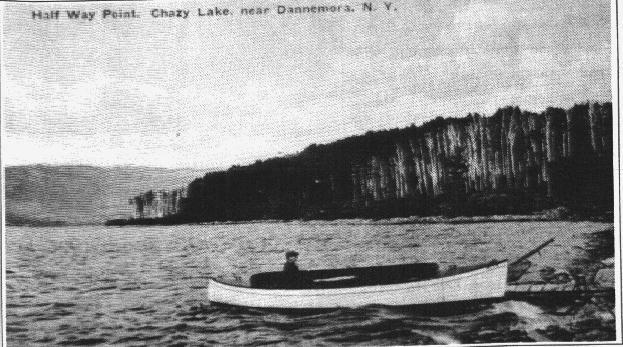 The following paragraphs are excerpts from "Chazy Lake, Facts, Fiction & Folklore", written by Kathleen King and Judith Lapoint. Assistant Researcher : Don Jackson. Most of the pictures below are also from this book. The book can be purchased from those individuals or contact me via E-mail. The price is $10.00. A bargain!!! 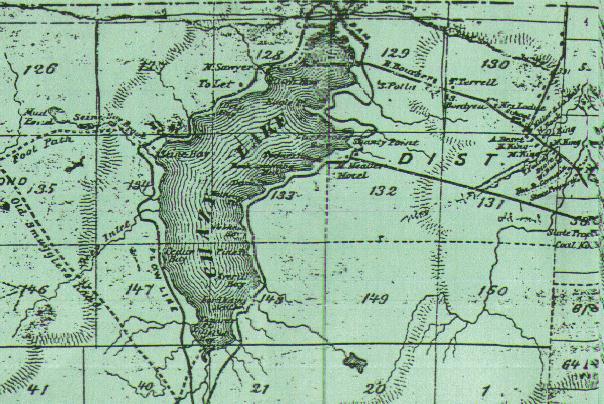 .....The map above shows the original shape of the lake before the dam was built in 1923 by William H. Miner. A log dam was built at the same location in 1870 but was destroyed by nature's ravages in 1898 or 1899. The dam raised the level roughly 8 feet, and the new shoreline is marked by a bold outer line on the map above. 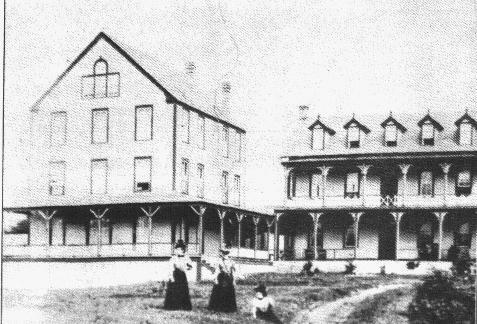 ....The Grand Hotels dotted the shores of Chazy Lake in the last half of the 19th Century, and into the 20th. Photos of some of them are below. 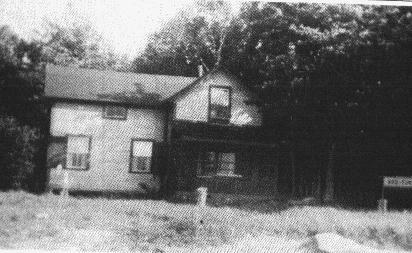 The Chazy Lake House was located near where the Pump House stands today, and marked on the map above as M. Meader Hotel. 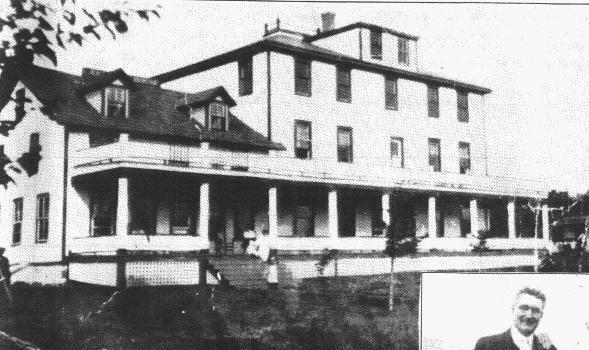 The Badger Hotel was on the Lyon Mountain side of the lake, near the "The Chazy Lake (Railroad) Station". The Station was erected in 1892 as a stop on the Chateaugay Railroad. A steam yacht named "Julia" was available to transport you to The Chazy Lake Hotel on the other side, fare 50 cents. A bargain!!! .....The Island is perhaps the most impressive landmark on the Lake. The home built for Reginald Werrenrath, a prominent baritone, became a summer haven for his family, his students and his many prominent guests. Mr. Werrenrath affectionately called his stone mansion "The Shanty". Mr. Werrenrath made his Metropolitan debut in 1919 in a cast that included the "Great Caruso" and Florence Easton when he sang "Silvio" in "Pagliacci." For a time he served on the N.B.C. music staff, and he appeared in Carnegie Hall. He devoted many years to teaching, and many of his students came to Chazy Lake and the sounds of their music drifted over the waters of the Lake. 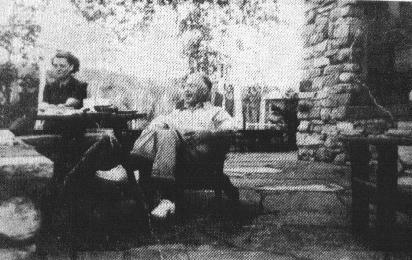 Mr. Werrenrath died in Sept. 1953, having spent his last 30 summers at his lovely cottage on Chazy Lake. An aerial photo of "The Shanty" is on Page 1. Reginald Werrenrath relaxing on the veranda of "The Shanty". This is Badger's Hotel (also known as THE LAKE VIEW HOUSE). George S. Badger, Proprietor (inset). This is THE CHAZY LAKE HOUSE. The original 2-story structure was built in 1869. This is an old photograph showing Halfway Point before Clarence Brennan built his(our)camp in those birch trees in 1954. This is an old photograph showing Ryan's camp. Built about 1907 by John Foy, deeded to Signor brothers in 1922. Then in 1935 to John Brennan, and in 1935 again to George and Elizabeth Brown. In 1950, deeded to Emmett and Reah Ryan and still in the Ryan and LaFountain family.